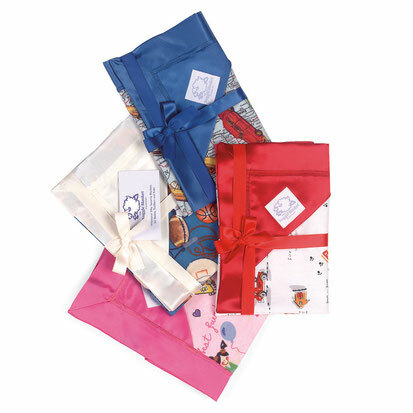 Welcome to the world of Nuggle Blankets; it's full of whimsical silky satin security blankets for your baby, toddler and big kids! Thanks for visiting our Nuggle Blanket site! Our collection is made up of cuddly flannels, washable silky satins and super soft cottons in an amazing selection of fun prints. The original Nuggle Blanket is our security blanket that will provide years of comfort to the child in your life and is sure to become a cherished object by both parent and child. The Big Nuggle is a wonderful compliment to our security blanket with its generous size and silky satin backing; it is perfect for swaddling newborns. The Nuggle NAP Sack and Giant Nuggle will take your child well into the toddler years and is the perfect bundle for daycare, travel or a trip to Grandma's! Just navigate to our Buy'Em page and choose your favorite Nuggle and fabric from our collection. NEW YEAR, NEW PRINTS FOR 2018! Take a peek at our new flannels! Visit our Nuggles ~ Buy 'Em page to see the adorable new additions.